The Little pink shop in the High Street. 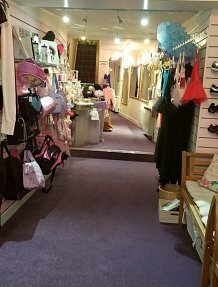 Dancewear of Fareham is well known as 'the Dance Shop' in Fareham's High Street providing good quality named dancewear. 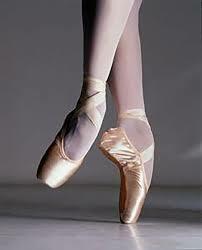 We have a huge range of dance shoes and clothing in stock for all forms of dance and also gymnastics. 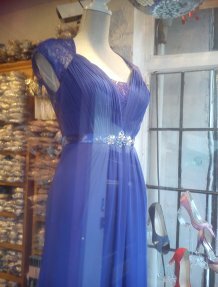 Not so well known is our stunning range of ballgowns, prom & cruise dresses. Rainbow Club satin shoes and handbags can be dyed to match any outfit . The dyes are mixed by skilled colourists to recreate the colour required and then applied by hand. The transformation is amazing and gives the shoes a bespoke one-off appearance, so the whole outfit has the designer look but without the expensive price tag. 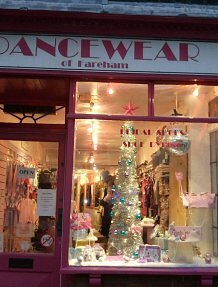 Dancewear of Fareham is situated just off the beaten track of the main West Street shopping centre in the attractive conservation area of the old High Street and is well worth the short walk from the precinct. Or park for FREE for 40 minutes in the High Street.